Cook offered simple advice for the coming five years in PR at the Institute of Public Relations Research Symposium in New York on Wednesday. NEW YORK: The PR industry needs more balls, Golin CEO Fred Cook said at the Institute of Public Relations Research Symposium in New York on Wednesday. At the event, Cook offered simple advice for the coming five years in PR. "My outlook in the future of PR is simply that PR needs more balls and I translate balls to mean courage," he said. 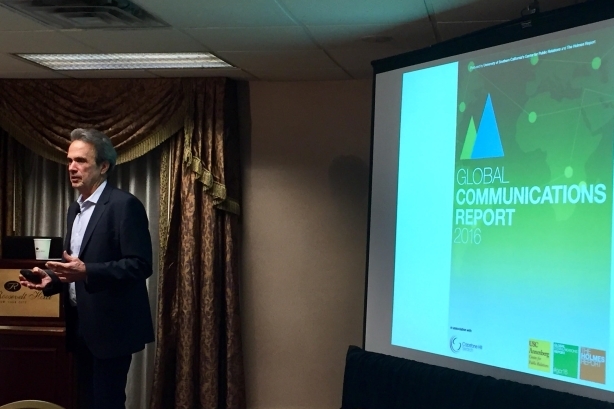 Cook presented the findings from the Global Communications Report, conducted by University of Southern California Annenberg Center for Public Relations. Six takeaways for PR pros Cook highlighted in the report, which was published in April, include: embrace change, hire different, get paid, own the sandbox, invest in ideas, and instill courage. In the survey of about 1,000 agency and in-house comms team leaders, only a quarter agreed that the words "public relations" would accurately describe the profession in five years. As the industry changes, Cook said one way to stay ahead is to look beyond the industry when hiring talent. Survey respondents said that they tend to look to other agencies or in-house teams when hiring. Another change coming to the industry is the continued blurring of lines between marketing, PR, and advertising. Cook urged PR pros to be bolder when going after work. "As PR people, we are known for swimming in our swim lanes and playing nice in the sandbox," he said. "But this is our opportunity to not play so nice in the sandbox." The nature of PR has changed dramatically as social media has taken over. As content and social media become more important, traditional PR skills like media relations and garnering earned media will become less important. About three-quarters of respondents said that PR will become even more complex in the next five years and subsequently, only a quarter said that would make the job more fun. "We’re looking at whether the term PR is still the right term," Cook said. "It needs to have a broader definition to include everything we do and we have to do a lot to change minds of people and show what we’re capable of."